For all you Dollywood fans, there are some new offerings this year. Dollywood opens March 31st, 2007 with the Festival of Nations. Dollywood's 2007 ride addition is a the new $17.5 million Mystery Mine steel coaster set to open April 13, 2007 after the Dollywood parade. Visit Dollywood for season pass information. Speaking of Dolly Parton - she will be doing a live concert at the Tennessee Smokies Stadium on May 20, 2007.. This is a special Charity Concert for the Ft Sanders Sevier Medical Center(hospital that serves the Pigeon Forge area). This is to help raise funds to build the hospital's new facility. Dolly has already pledged a large gift for the hospital.. Find information at http://www.ConcertsintheSmokies.com *** Dollywood is not affliated with this special charity concert. Why not try something out of the ordinary on your next trip to the Pigeon Forge - Gatlinburg TN area of the Smoky Mountains ?? Experience a Truly Unique Way to enjoy the Smokies... A Llama Trek with Smoky Mountain LLama Treks! Smoky Mountain Llama Treks lets you enjoy the spectacular views, scenic hiking trails and the natural beauty of the Great Smoky Mountains without all the burdens! These friendly, fluffy pack-llamas are there to lead NOT ride ! The professionally trained pack llamas carry your gear, food and supplies so that you can relax and enjoy the most spectacular scenery in the world. Each llama has a unique personality that will add a new dimension to your hiking adventure. What fun !! You can choose from a variety of Smoky Mountain Llama Treks, 1 Hour, 2 Hour, 6 Hour, Kite Flying Treks, Nature Photograhpy Workshop Treks, Overnight Safari Treks are just of few of the choices. 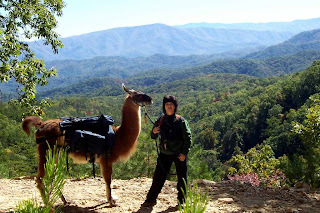 Sandy Sgrillo, owner of Smoky Mountain Llama Treks is as diverse and unique as her llamas. She has successfully owned, managed and performed in a popular Miami Live-Entertainment Show, did modeling work featured in TV Shows, as well as other opportunities to meet and spend time with hundreds of famous celebrities. Yet, after 16 years of her "city-slicker" ways, her desire to live in the Smoky Mountains was strong enough to make her leave the famous, white beaches of Miami for the awesome scenery of the mountains. Featured in countless National Newspapers, TV Shows and local TV Stations, Smoky Mountain Llama Treks has overcome all obstacles and has become the SouthEast's most sought after Llama Trekking experience. Thanks to Sandy's insight, perseverance and determination, people from all walks of life, even in wheelchairs, are now able to share the fun and adventure of llamas and llama trekking! Sandy even allows some well-behaved dogs with approval to enjoy the llama hiking experience. Thrillseekers - here is your chance to be one of the first Zorb riders in the United States... ZORB is Opening Summer 2007 in Pigeon Forge TN! Straight from New Zealand and for the first time in the US you can experience the revolutionary Zorb. Zorb - It's 11 feet high, 11 feet fat, it's round and bouncy. You can jump inside and roll down a 700 foot long hill. It looks really cool & fun but I'm not sure I will be lining up first - lol! Try the Hydro Zorb for a slippery ride that's like a cross between a waterfall and a roller coaster or the Harnessed Zorb for maximum G-force as you are strapped in rotating head over heels. From what I understand, the Hydro Zorb is a smoother ride as the small amount of water acts as a cushion to hold you upright. The Harnessed Zorb is for those with stronger stomachs ! 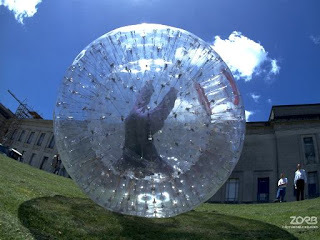 There have been several national TV commercials sporting the Zorb, one was a Bellsouth USA ad. In 2004, The TV show Amazing Race sent their team and contestants to New Zealand to go Zorbing. Open year round rain or shine. Directions: From the Parkway at Traffic Light #1 go east on Sugar Hollow Road ½ mile and the Zorb site is on the left. It is located behind the Cracker Barrel and National Parks Resort Lodge in Pigeon Forge. Surprise someone in your family. Go ahead and plan your summer vacation trip to the Smoky Mountains to check out the Zorb in Pigeon Forge. Our cabin rentals are booking up quickly for the spring and summer. Check our website for rates and reservations at http://www.HeavenlyCabins.com We offer great luxury cabin rentals that are family and pet-friendly near Gatlinburg, Pigeon Forge, Townsend and the Great Smoky Mountain National Park.